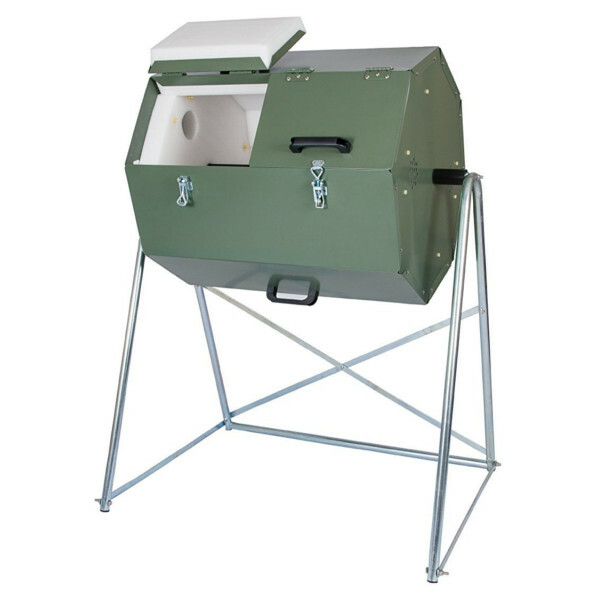 A rotating heat-generating and insulated composter for convenient and simple use all year round. Enjoy seeing the transformation of your kitchen waste into nutritious compost – compost you can use to fertilize lawns, pot plants and flower beds. From apple-cores to verdant lawns, join the Composting Revolution! I can’t stop showing all my friends how hot the compost is inside this composter in the middle of deeply freezing temps here in the mountains. I add a little handful of alfalfa pellets every so often, plus following the instructions in the manual, and this baby cooks! Finally I’ve found a way to compost that is not just a feeding station for wildlife, rodents, and flies. No flies with this. Quick compost. Easy to unload into our wheelbarrow. 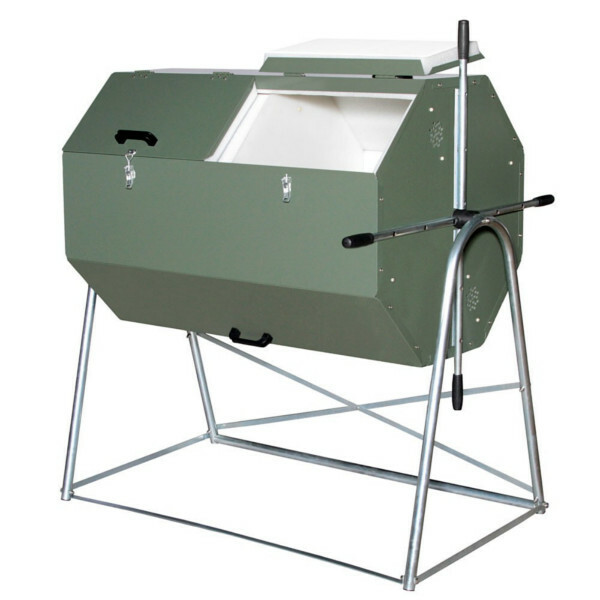 The gold standard in composters. I bought this for the dual bin feature. The construction is high quality, the design well thought out. Well it cost enough to get it here! But wow this is a serious unit. I don’t know how the plastic composters hold up after years of sun exposure or winter freezes, so I got this steel one which looks like it’ll last longer than me. It looks real well made but I hope the legs hold up if I ram into them with a heavy wheelbarrow. The handles for turning are a good feature cause where I live its freezing right now and you don’t want to put your hands on the steel or they’ll be stuck til spring. I give it four stars for now. If it holds up a few years then give it five stars. I have been composting for years using a plastic bin open at the bottom, it was inexpensive but a lot better than our old pile in the corner of the yard. But I forced the lid when it was frozen last winter and cracked it badly. I wanted a new composter that will not crack in the freeze. 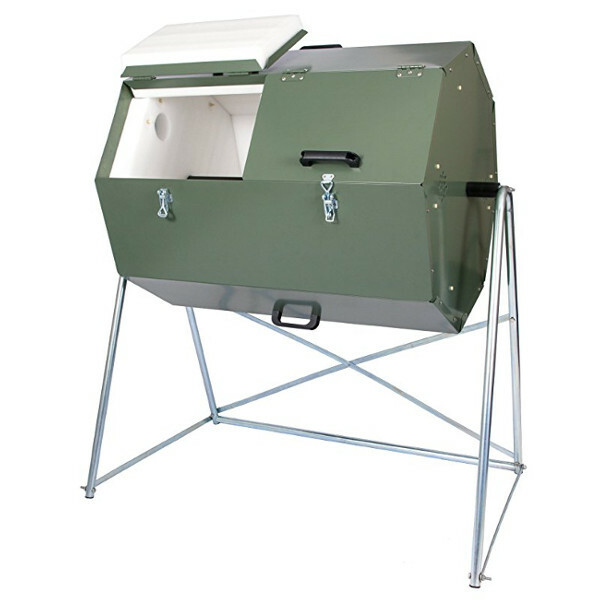 This new composter is the cat’s meow! It’s almost too nice to put compost in.